I was feeling blue at work (this happens when you have difficult clients and a lousy leader) when I received an email from Frat of theQguides.com, inviting me for a food review at Dubrovnik in Solaris Mon’t Kiara. I’ve tried Hungarian, Czech, German, French, Austrian but not Croatian cuisine, so without skipping a beat, I agreed. Come Wednesday, I was stuck in a jam, rushing out of Damansara Uptown to get to Mon’t Kiara – and I reached the restaurant an hour late. Becky passed two large bowls to me – the Spaghetti ala Buzara, and a risotto looking dish. I thought it was risotto, until I took a bite – it didn’t have the same taste and texture. Puzzled (and slightly embarrassed not knowing what it was), I kept quiet. Until FBB wrote about it, saying it was orzo. A quick search on the net revealed that an orzotto is like a risotto. Except that orzo, is a rice-shaped pasta, instead of rice. It is easier and more flexible to work with, than rice, as rice tends to get overcooked easily. 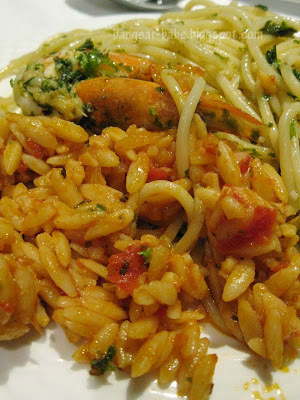 The orzo dish was creamy and orange-red in colour. I thought the tomato based sauce coated the pasta well, giving it a subtly tangy flavour. The orzo itself had a wonderful texture that was both slippery and firm. 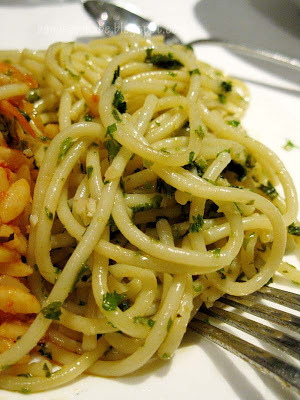 Spaghetti ala Buzara looked like a glorified aglio olio. With fresh, plump shrimp cooked in a light sauce made of garlic, olive oil, chopped parsley and white wine, the pasta was richly buttery and fragrant from the assortment of herbs. Since I was late, I got to eat the bottom bit, which was the best part. Yum! I’m not a huge fan of baked potatoes, and would choose fries/chips over them anytime. 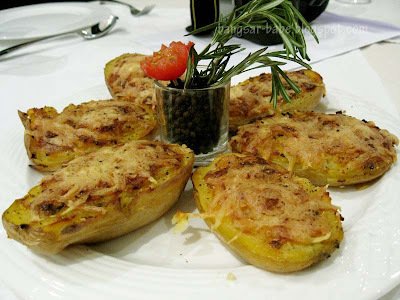 However, the baked potatoes with cheese won me over. 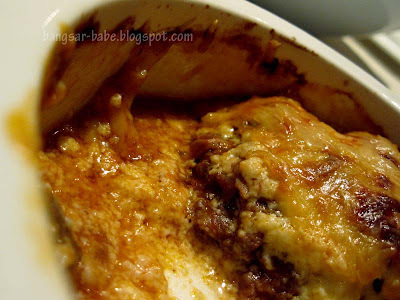 The slightly crisp skin gave way to a fluffy centre and the browned cheese topping added a savoury touch to the potatoes. 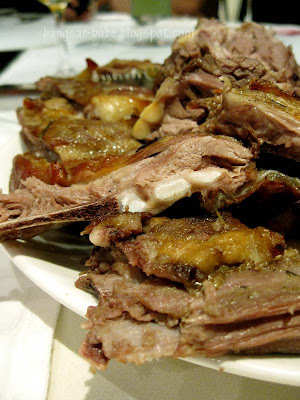 If you love roast lamb, you will probably enjoy the lamb peka. rif and I both did. 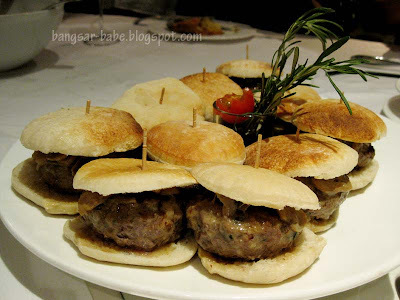 Served with thick potatoes slices and caramelised onions, the lamb pieces were slightly fatty and exceptionally tender. Every bite was flavourful and aromatic from the spices. Good thing the plate was not placed in front of me; I would have eaten everything till the last bone! If I’m not mistaken, you have to order this in advance. 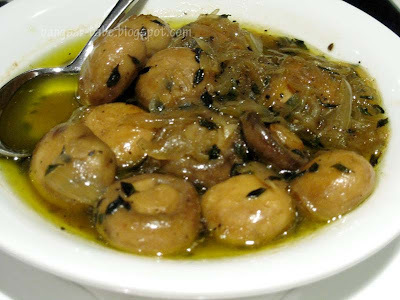 I didn’t think much of the button mushrooms. rif liked them more than I did – personally, I’d prefer them to be fully flavoured. 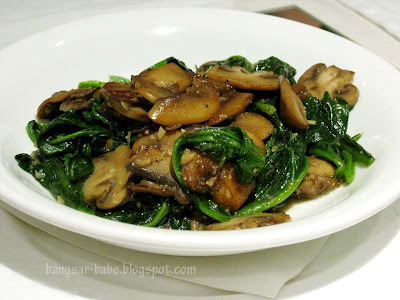 The mushrooms with leafy greens didn’t look Croatian to me. It looked like any ordinary vegetable dish. It was alright, but nothing spectacular. 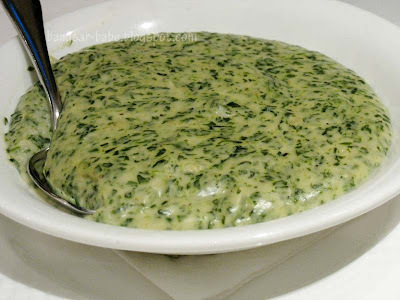 Alone, this creamy spinach dish would be too rich for some. It would have gone very well with bread or tortilla. I personally love creamy dishes (the creamier the better) so I enjoyed this. Sitting at the far end usually means you get the last bit of food on the plate. But that isn’t always a bad thing. By the time this baked lamb dish reached me, I got all the nice cheesy bits stuck at the sides of the dish and a nice tender chunk of lamb. 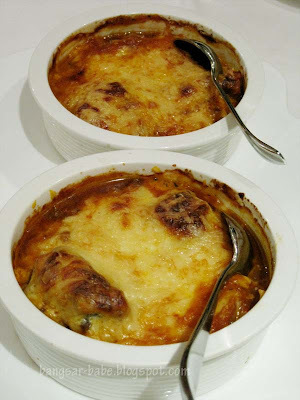 I found this to be a cross between moussaka and goulash – incredibly rich, chunky and flavourful. The burger was very good. Some were complaining it was too salty, but I loved it. I had TWO burgers with juicy patty and stringy cheese. Did you just gasp? Oh ssshhhh! The minute I got hold of the burger, I ditched the cutlery, and used my hands. Just when I thought the burger couldn’t be any better, I bit into a huge chunk of feta cheese at the centre of the patty. It was so good, that I shut out conversations around me and sat in silence for a good 10 seconds. Dessert was Crepe Suzettes with plenty of Cognac flambéed at the tableside. I used to think this was one of those tricky time-consuming desserts to make, but Zoran Djumic (owner & head chef) made it look pretty simple. 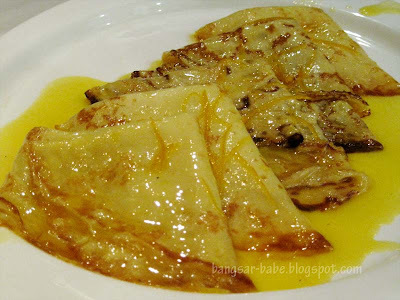 This was quite decent, but you will have to eat it quickly to prevent the crepe from drying. Dinner was hearty and full of rich flavours and textures. I had a great time sampling so many dishes and enjoying the company. Thank you Dina & Zoran, for your generous hospitality! Verdict: Prices may be slightly steep, but Dubrovnik makes up for it in portion and taste. u took 2 burgers! Heehe I would had had as well, but me qutie sensitive to salt! dont worry, i've neither heard or tasted ORZO or whatever you call it. I just can't resist their burgers. The bread were made fresh and the beef patties are fantastic. Ooh Yum, I've been contemplating for quite awhile whether or not to try this place. Now I shall. Lol, I was at Nirvana's today trying to pack 3 rava dosas. It took 30 minutes – no kidding. The manager, with all due respect, has turned into quite a biatch too. Brian – Try and let me know what you think! As for Nirvana, I always found the manager arrogant. But she has never stepped on my toes, yet! J2Kfm – It was quite nice…if only we had bread to use as a dip!